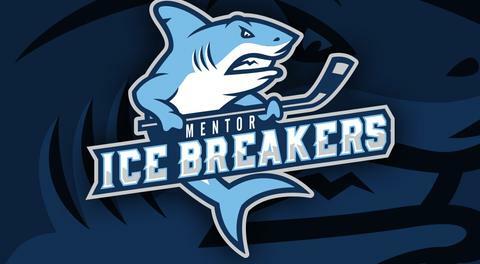 The Mentor Ice Breakers conclude their regular season this week with three home games in three days against the Watertown Wolves, Port Huron Prowlers, and Elmira Enforcers. After taking on the Wolves on Thursday, the Ice Breakers will host a postgame skate following Friday night’s game against the Prowlers. Saturday’s season finale against Elmira will be Fan Appreciation Night. There will be prizes and giveaways throughout the game in addition to a t-shirt giveaway to the first 300 fans through the doors. The top four spots in the final FHL standings are set in stone heading into this week’s games. The only movement that could occur over the final few days of the regular season is the Ice Breakers digging themselves out of last place for the first time since early November. Mentor is three points back of the fifth-place Danville Dashers with a pair of games in hand. Danville will wrap up its regular season this weekend with a pair of games against the league-leading Carolina Thunderbirds. Forward Mark Essery (23-28-51) became the first Ice Breaker to hit 50 points last weekend with a three-point performance against Elmira. Essery leads the team in both goals and assists and will be looking to put the finishing touches on a fantastic rookie campaign. Tommy Mahoney (12-23-35) is the Ice Breakers second-leading scorer and seems to be improving as this year goes on. The Assumption College product has found the back of the net in four of his last five games and has six goals and 11 assists for a total of 17 points over 19 games since being traded to the Ice Breakers. 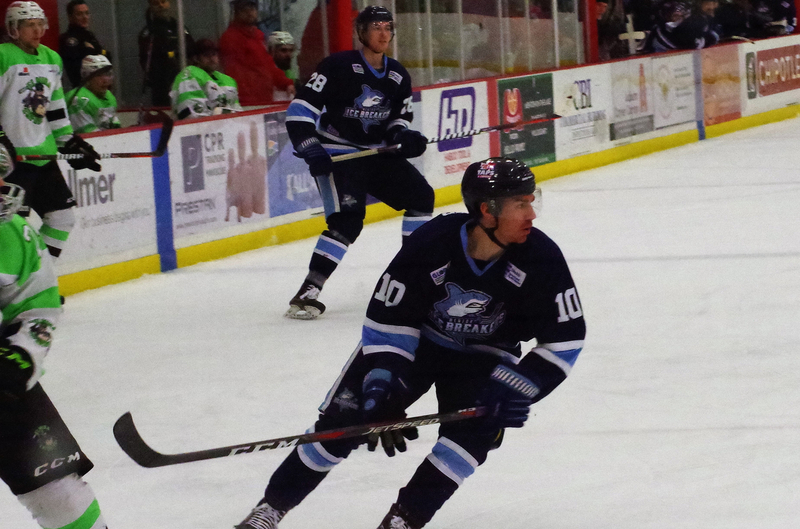 Cleveland, Ohio native Jon Buttitta is averaging a point per game since signing with the Ice Breakers. The former Kent State Golden Flash scored a pair of key third-period goals last Friday in Mentor’s 4-3 win over Elmira on the road. Buttitta’s former college teammate, defenseman Michael Sullivan, signed with the Ice Breakers prior to last weekend in light of recent injuries and appeared in his first two pro games. With 17 goals on the year, Matt Kadolph is another player who seems to be improving with every game he plays. He has at least a point in seven of his last nine games with four multi-point performances during that stretch. Parker Moskal has cooled off a bit since his hot start, but he remains a key piece of the Ice Breakers offense with a 9-13-22 scoring line over 15 appearances. Derek Moser has been forced into a workhorse role with a recent injury to John Sellie-Hanson, and he’s responded well. He has posted at least a .900 save percentage in three of his last four outings, including a 39-save performance in Mentor’s 6-3 win over Port Huron on March 24. Moser will look to continue his strong stretch of play as the season wraps up this week. 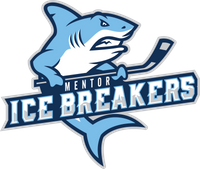 As a team in its inaugural season, the Ice Breakers still have plenty to play for despite being eliminated from playoff contention. No one wants to finish at the bottom of the standings, and several players will be battling for future roster spots. Outside of one rough patch that saw them suffer through a double-digit losing streak, the Wolves have been a remarkably consistent team. Led by 100-point scorer Tyler Gjurich, Watertown is sure to be a tough matchup for anyone in the postseason. The Wolves are preparing for a first-round matchup against in-state rival Elmira, which will also be making a trip to Northeast Ohio this weekend. The Wolves offense has been on fire as of late with 31 goals over their last four games, including back-to-back nine-goal outputs against Danville and Port Huron last weekend. Watertown seems to recover no matter how many players it loses to injury or SPHL call-up, something that’s been evident throughout the year. The Wolves kicked off the season with a roster stocked with top FHL players like Gavin Yates, Anton Lennartsson, and Brandon Wahlin. None of those three are currently listed on the Watertown roster. Forward Yianni Liarakos has been a strong addition in Watertown. The Hungary native has a 16-11-27 scoring line over 20 games with Watertown and is averaging 1.5 points per game on the season. He scored a highlight-reel goal against Danville last weekend that saw him juggle the puck past the Dashers defense. Kyle Powell (6-57-63) is a slick-passing defenseman who’s become Watertown’s second-leading scorer while Lane King (18-34-52) has managed a 50-point season despite appearing in only 31 games. All in all, the Wolves collection of talented scorers has resulted in a dangerous power play that converts on 19.7 percent of its chances, second-best in the FHL. Rookie netminder David Otter has played well in his first five pro appearances with a 4.05 goals-against average to go along with a .907 save percentage. The Wolves goaltending situation has been a bit of a revolving door throughout the season, but Otter and veteran Jared Rutledge seem to have settled things down. The Prowlers have won their last two games at Mentor Civic Ice Arena, although the Ice Breakers won the most recent matchup between the two clubs by a 6-3 final on March 24 in Port Huron. The Prowlers will be tasked with a first-round series against Carolina when the FHL playoffs kick off. Port Huron lost its last game against the Thunderbirds in blowout fashion by a score of 11-2, but it handed Carolina its most recent loss the night before. Port Huron’s all-time leading scorer, Matt Robertson (40-58-98), needs only two more points to join Jay in the 100-point club. Matt Graham, Zachary Zulkanycz, and Matyas Kasek round out the Prowlers’ veteran corps of offensive talent. Defensively, the Prowlers have struggled in recent weeks due to an injury to starter Cory Simons. Cody Karpinski has been shaky since taking over as the everyday netminder, but Port Huron’s release of backup goalie Jordan Neamonitis indicates that Simons will play this weekend. The Ice Breakers will be looking for revenge after the Prowlers topped them in two consecutive games in Northeast Ohio from March 22-23. Led by player-coach Joe Pace Jr., Port Huron is a talented offensive club that is leading the season series against Mentor with a 6-5-0-0 record. Tensions are sure to be high on Saturday’s season finale against the Enforcers. Last time these two clubs saw each other, extracurriculars revolving around Mentor’s Brody Duncan and Elmira’s Brandon Vuic contributed to a combined 84 penalty minutes in the game. Duncan is done for the season after receiving a five-game suspension while Vuic will be out until the playoffs with a two-game suspension. In the series between the Enforcers and Ice Breakers last weekend, neither of Elmira’s leading scorers, Ahmed Mahfouz and Stepan Timofeyev, played in a game. Mahfouz hasn’t played March 10 while Timofeyev’s last appearance came on March 17. It’s unclear whether or not either player will be in the lineup against the Ice Breakers. Mentor dropped its first six games of the season against Elmira but finally found the win column last Friday night before falling in a shootout the following evening. Gavin Yates (31-27-58) and Sean Reynolds (27-30-54) have carried much of the load over the last few weeks while Anton Lennartsson has 14 points (7-7-14) in 12 games since being traded to Elmira. Troy Passingham and Nick Niedert form a formidable veteran duo between the pipes. Passingham has stood out as a top goalie this year with 2.81 goals-against average and a .925 save percentage. In an offensive league like the FHL, those numbers are quite impressive. Overall, the Enforcers are the second-best defensive club in the league, allowing an average of 2.92 goals per game. The Enforcers, who are gearing up for a first-round series against Watertown, will have a playoff preview the night before taking on the Ice Breakers when they travel to upstate New York to battle the Wolves. The best-of-three series will open on April 12 in Watertown before moving to Elmira for the second game and a potential deciding third contest.